Funfetti Pancakes are packed with sprinkles and a secret ingredient to lend a cake batter flavor. Fun for a birthday celebration or any day that needs a little brightening. You know it’s going to be a good day when it starts with homemade pancakes. When they are studded with sprinkles and taste like cake batter it’s pretty much guaranteed to be excellent. Because don’t sprinkles make everything better?! I’m fully in the camp that yes, yes they do. Noah wanted breakfast for dinner, or lovingly brinner in our house, for the his first day of school dinner. When I was a kid we had the tradition of homemade lasagna on the first day of school but this picky kid of mine doesn’t like lasagna so the tradition has transformed to some sort of different carb laden dish for dinner. It usually rotates between macaroni and cheese and breakfast food. The first day of school is a big deal so we needed something celebratory and in comes these Funfetti Pancakes. Not only are they extra fun because of the huge dose of sprinkles throughout but they taste like birthday cake. I started with my favorite pancake recipe of all time as the base and added some secret ingredients to turn them into cake battery goodness. And don’t worry, the “secret” ingredients are easy to find in the baking or spices aisle. Butter extract and almond extract are the magic trick to cake batter flavor. The butter extract is what really gives that batter flavor and a touch of almond extract adds depth and interest to the pancakes. The original recipe calls for sour cream or plain Greek yogurt to add moisture and a little tang but I chose to use vanilla bean Greek yogurt to up the vanilla flavor and makes them a little sweeter. That’s what I recommend using but plain will work too if that’s what you already have at home. Once the batter is mixed up, let it sit for 10 minutes to thicken and let the flavors mingle. This also helps the pancakes rise as they cook. When it comes to cooking these cute little pancakes, a lightly greased griddle or nonstick pan is the best way to get that nice golden exterior. I have a huge electric griddle that I adore and always use when making pancakes. You can fit quite a few pancakes on it at a time making the recipe even easier to whip up. It doesn’t look like the one I own is available any longer (it’s at least 3 years old) but this one is similar, has great reviews and is an amazing price. Definitely recommend it if you make pancakes, French toast, bacon often. Your griddle or skillet should be over a medium-low heat to get them cooked through and golden on the outside. I personally believe butter is the best way to grease your griddle. It lends an extra dose of buttery goodness and helps the exterior get golden and crispy. 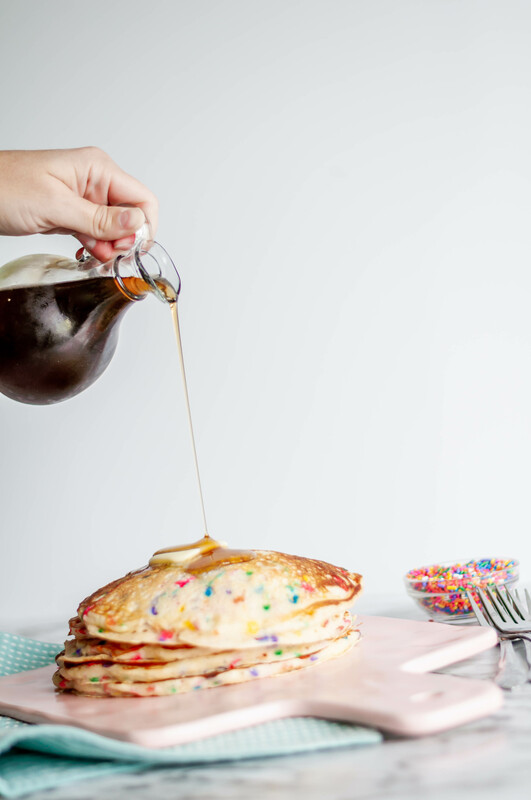 So whether you’re celebrating something special or just need to boost that Monday mood these Funfetti Pancakes are sure to do the trick. In a large bowl, whisk together flour, sugar, salt, baking powder, baking soda and sprinkles. Set aside. In a medium bowl, whisk together buttermilk, yogurt, butter, vanilla extract, butter extract and almond extract. Add to bowl of dry ingredients and stir until just combined. It's ok if there are some lumps and bumps. Set aside for 10 minutes. Meanwhile, preheat a griddle or large skillet. Add a small amount of butter on the preheated skillet/griddle and scoop out pancakes using a 1/2 cup measuring cup. Cook until edges are set and bubbles appear on the pancakes. Flip and cook until golden on the second side.